My AC1900 First Look: NETGEAR R7000 & ASUS RT-AC68U has been a popular read since it posted about two weeks ago. Since then, ASUS still hasn't delivered a driver for its PCE-AC68U card that enables TurboQAM and its firmware remains a work in progress. NETGEAR, on the other hand, seems content to stand pat with its first firmware. I still haven't gotten around to testing the TurboQAM feature of any of these three routers and frankly, I'm in no big hurry to do so for the reasons I described in AC1900: Innovation or 3D Wi-Fi?. I'll probably do a separate article covering all three, once things have settled down and Broadcom and ASUS get their TurboQAM client-side acts together. 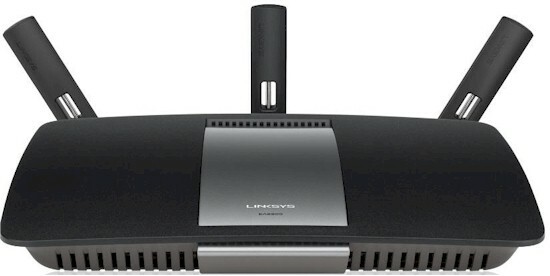 So, please note this review of Linksys' EA6900 tests it as an AC1750 router. The EA6900 is designed to sit flat on a table or desk. If you want to hang it in a wall, there are mounting slots on the bottom side. But they are at the left side of the router, so it will hang with all connections pointing right. There is a user manual posted on the EA6900's support page. It describes the main router admin features using a How To approach. Less experienced users may find this more helpful than the usual describe-the-screenshot "What"-centric approach taken by most router manuals. One thing you won't find in the user manual is any mention of the SimpleTap easy-connect feature. Since there was no SimpleTap card in the box either, it looks like this feature has been relegated to the seemed-like-a-good-idea-at-the-time pile. Following the trend adopted by many new routers, the EA6900's installation doesn't require running a CD. (Oddly, there is one in the box, but it contains only a user guide that you can download anyway.) All you need to do is plug in your modem cable, power it up and try to hit the internet with a browser. You'll get redirected to a setup wizard that will get you up and running in no time. Like NETGEAR and ASUS, Linksys has also temporarily suppressed the inside photos in its FCC filings. So I opened it up after testing to find a design an interesting mix of the NETGEAR's and ASUS designs. The most notable finding is that the EA6900 uses the Broadcom BCM4708A. This leaves the NETGEAR Nighthawk as the only AC1900 router using the 1 GHz Broadcom BCM4709A. The key components for all three routers are summarized in Table 1 below. Here's a look at the top of the EA6900 board with its RF covers removed so you can see the two BCM4360 radios. Both radios have the same outboard Skyworks 2.4 and 5 GHz amplifiers used in the Nighthawk. All three routers use dual-band external antennas that require combining the two radios' RF before they hit the antennas. But Linksys keeps the two radios completely separated instead of putting them all into a single compartmentalized RF enclosure as ASUS and NETGEAR did. There are a few more internal photos in the gallery below. The EA6900 has the least amount of heatsinking of the three AC1900 designs. The board easily lifts out of the case to reveal heatsinks thermally coupled to the area under the areas under the outboard 2.4 and 5 GHz amplifiers on the top side. Removing the CPU heatsink and RF shield tops show all the key components in this all-Broadcom design. And the ASUS RT-AC68U gallery.